I guess I’ve never really done this – but today I feel like sharing from my heart – about something going on in my life. I feel a bit like a fish out of water writing like this. I can write all day about cake, but about prayer and Bible study? I don’t feel adequate. However, this topic is so heavy on my heart – I really want to write it here. For the past several weeks, I’ve been teaching a Women’s Bible Study on Sunday nights at our church (another area where I feel completely inadequate – but He is strong in weakness, 2 Corinthians 12:9). 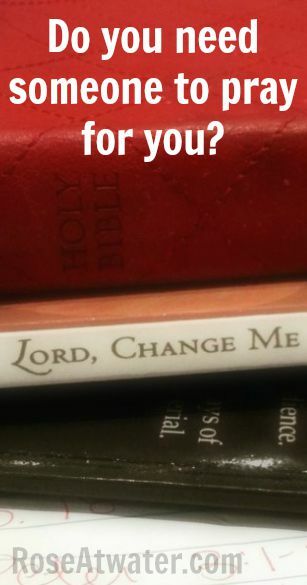 The name of the study is “Lord Change Me” – and the focus for the last few sessions has been prayer. 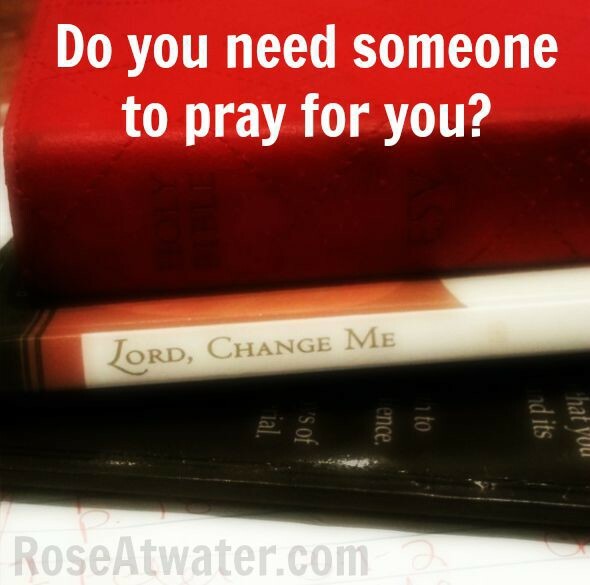 My question for you today is this: Do you need someone to pray for you? Last night we studied about how we’re changed when others pray for us. Somehow – having read and studied the Word for all of my life (and having taught this Bible study a few times before) – this subject came alive to me last night. The lesson focuses on this verse: “Bear ye one another’s burdens, and so fulfill the law of Christ.” Galations 6:2. I feel like I’m probably pretty good about sharing physical needs – if I’m sick or my kids are sick or our dryer is broken or you know – things like that… then I share and ask. But the deeper things – the times I’ve doubted my faith, or my husband and I are at odds with one another, or I’m holding onto anger or bitterness or unforgiveness… those things I don’t share. Instead, I’ve been guilty so many times in my life of bearing those burdens alone. Sometimes it’s because I feel lonely – I feel like there’s no one to share with (although I know that’s not true), but there are also times I haven’t asked because of shame, embarrassment, or feeling like my burdens weren’t worthy of someone else’s time. I would make the choice instead to keep them to myself. This is wrong. It sounds like to me that scripture commands that we bear one another’s burdens. It’s not a request or a suggestion – it’s written in statement form. It is required. As I’ve really meditated on this yesterday and today – I’ve become burdened for a handful of women in my life, to really commit to pray for them daily. Some are my closest friends, some are acquaintances, some are strangers to me – and some are even what I’d consider “enemies”. They may or may not know that I’m praying for them – but the important thing will be that I’m asking God to help me bear their burdens. Just as importantly, I’ve become convicted to share my burdens. To really reach out to prayer warriors in my life and ask them to pray for me. To know and recognize that God intended it that way and that He will use their prayers to take care of me. By that – I’m incredibly comforted. So will you join with me? Ask a friend to pray for you as you struggle. Reach out to someone in your life – your church – or even to me. I would be happy to pray for you. At a time when political correctness trumps over religion, it is very refreshing to hear someone bring the word of God to her followers. Prayer works, perhaps we don’t always get what we ask for, but the real healing comes in accepting God’s will in our lives. Thank you for sharing. Thank you for commenting and being an encouragement! Thanks so much Kim! What an amazing testimony you have! Thank you for sharing on prayer/praying I believe the Lord is speaking to me.